1. With rooms facing the spectacular Chain Bridge and offering scenic views of the ancient city of Buda and beyond; interiors that tell a story of a bygone era with intricate mosaic tiles and hidden iron elevators – The Four Seasons Gresham Palace is ‘the’ hotel that I would suggest while visiting Budapest. Kempinski Hotel Cornivus comes a close second, thanks to its intimate proximity to revered monuments, shopping streets, parks and also for its trump card – the Japanese god of restaurants, Nobu. 2. If there is one city where you should save a couple of days purely for sightseeing, it’s this one. I spent three days canvassing Budapest for its treasures and I still came back with a list of places unseen. In Pest, the must-sees have got to be the magnificent St. Stephen’s Basilica, Heroes Square, The Museum of Fine Arts, The Parliament House and The Dohány Street Synagogue. A special mention for the Hugarian State Opera House, where a tour of the building is as mandatory as it is exhilarating. Unwinding at Callas, a nearby restaurant, for pre-sunset champagne is equally necessary. 3. Walking along the Chain Bridge to reach the delightfully quaint funiculars that take you up to Buda Castle would justify a morning well spent, but the museums within the castle tell a story that’s worth your while too. I made a day of it by strolling across to a charming little flea market and the infinitely detailed Matthias Church, stopping for lunch at Buda’s oldest coffee house, Tarnok (soul-quenching pizzas here) and continuing the evening at Fisherman’s Bastion, a superlative dining venue that delivers a double whammy – unparalleled views of the river and monuments as well as a modern menu that achieves perfect fusion between traditional Hungarian cooking and international cuisine. Try the local wines they suggest, and make sure you buy some on your way back home. 4. While the much-touted Andrássy Avenue does hold pride of place as the city’s premiere shopping street, I found the local shops more appealing. Vaci Utca is where one goes for high-street finds but I was able to source some delicate jewels modelled in the style of erstwhile Queen Sisi’s baubles. Philanthia is a veritable Alice in Wonderland-space where flowers, knick-knacks and household pieces pop out from every available corner. The Market Hall is a foodies’ paradise – mushroom, meats, sauces and every authentic Hungarian cuisine element can be found here. Nanushka is great for souvenirs – hand-embroidered silk blousons, crochet table cloths, etc. 5. The connoisseur buys in the city however, lead one to antique stores. 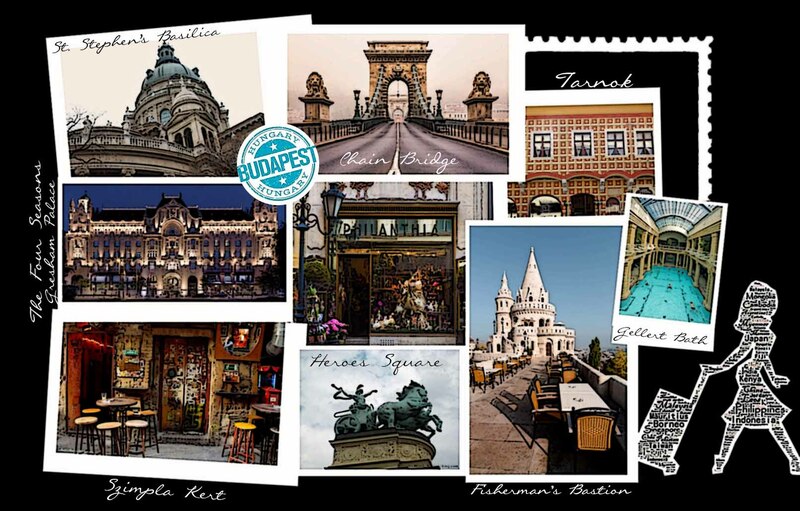 Budapest is famous for its vintage silver, old photographs and filigree works, one-of-a-kind crystal and porcelain. And the best place to source these gems are on Falk Miksa street, dotted with shops where one is sure to lay claim on an heirloom of some sort. 6. A very unique feature of this city is its ‘ruin’ bars – usually al fresco areas in the Jewish quarter, haphazardly put together to create an individual, eclectic buzz where the cocktails are generous, delicious and mind-bogglingly cheap, and where the vibe is undeniably friendly and relaxed. My utmost favourite was a place called Szimpla Kert. 7. Budapest is clearly a city that never sleeps thanks to its burgeoning youth population. And there is absolutely nothing to match what is called the Gozsdu Courtyard, a labyrinth of eateries and bars, all seemingly connected to one another in an organised maze, open 24/7. The energy of this entire hub is pulsating to say the least and almost any place here is a good choice for food or drink. 8. When in Budapest, do as the locals do and that means becoming a party animal. I managed to go a distance (and that’s saying a lot since most spots in the city are accessible by foot) to find the A38, a ship that has been converted into a nightclub, with different levels dedicated to different music genres. What I loved most was the casual vibe; nobody is dressed to the nines here and most crowds are welcoming and chatty with tourists. But for some timeout one evening, I did try the Danube River cruise, which was soothing and informative – big thumbs up. 9. While the new age has brought in a spate of clubbing, the old ways of Budapest are equally popular – especially the time-tested ritual of the Hungarian thermal baths. I chose to try the oldest one in Buda, the Gellért Bath and it was an interesting experience of sorts, kind of like a communal swimming pool exercise, with a series of pools heated to specific temperatures. I recommend a nap after! 10. Margaret Island is the weekend secret that Budapest happily shares with everyone. Singing fountains, Japanese gardens and picnic-style food all make this a definite visit on my list, especially on your last day when you need to wind down before your long journey back home.